The gallery talks are an opportunity to engage with an exhibition at a deeper level, under the guidance of an expert. The second speaker is Paula van den Bosch. She will guide visitors along a personal selection of artworks from the exhibition. Paula van den Bosch (1964 NL) is an art critic and senior curator at the Bonnefantenmuseum Maastricht. In 2000 she published a catalogue raisonné of the Visser Collection: a renowned collection of neo avant-garde art kept by the Kröller-Müller Museum in Otterlo. Since 1998, Van den Bosch has mainly programmed solo exhibitions of artists such as Luc Tuymans, Roman Signer, Joëlle Tuerlinckx, Patrick Van Caeckenbergh, Peter Doig, Lily van der Stokker, Pawel Althamer, Thomas Hirschhorn, Monika Baer, Laura Owens, Mai-Thu Perret, Mary Heilmann, Rebecca Morris, Ernst Caramelle, gerlach en koop. The ANSCHOOL (2005) and gerlach en koop exhibitions (2016) were nominated for the AICA certificate for Best Exhibition. ANSCHOOL (2005) won the AICA certificate for best exhibition in 2007. For 2019 Van den Bosch is developing exhibitions with Dan Walsh, Paloma Varga Weisz and Ine Schröder. 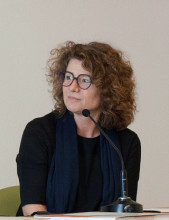 Besides her activities as curator, Van den Bosch regularly contributes to the educational programs of for instance the Jan van Eyck Academie and Maastricht University. She is also involved with the Royal Award for Modern Painting from 2018 to 2022, in the capacity of chair of the jury.